A couple moved into their new house having just moved from out of state. However, what they were still missing were their horses, boarded back in their old home. They needed a horse pole barn so they could bring them home. And not just any home but a place whe re they felt comfortable and safe, a home built with nothing but quality in mind. So they picked PermaBilt® to build their new horse pole barn. One of the many details that sold them on PermaBilt®, a post frame pole building construction builder since 1973, were the PermaStalls®. These unique horse stalls include three walls, seven feet tall, made from 2” x 6” Standard & Better tongue and groove with a grilled stall front. 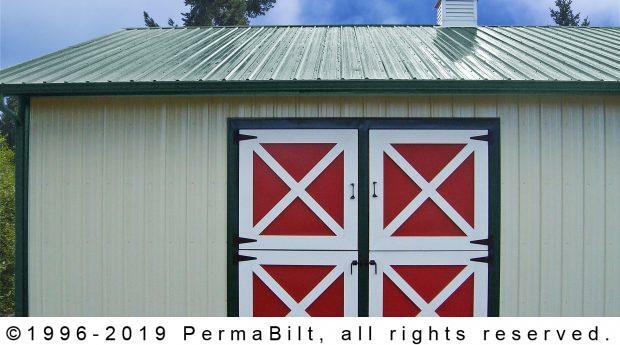 For interior access within the barn, the PermaStalls® include 4’ x 8’ grilled sliding doors which are made of grilled stall front and grilled sliding door. For access to the outside and their fenced paddock, 4’ x 8’ red steel Dutch doors with decorative cross hatch and trim, were installed. These solid doors have four galvanized T-hinges, one galvanized barrel bolt and one galvanized gate latch and one galvanized hook and eye latch. All are galvanized and black powder coated. Once these elements and more were added and the barn completed, the newly arrived Orting Washington couple could not hardly wait to bring their animals to their new home with nothing but quality keeping them happy and safe.